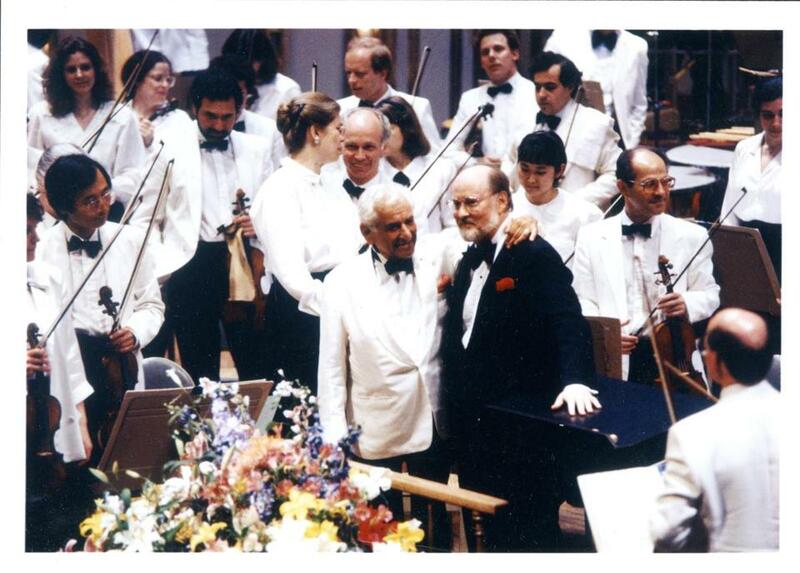 Five Pops concerts in May will consist of compositions by Leonard Bernstein (center left, with John Williams in 1989). Also in May, Williams will return to lead his traditional film night. A centennial celebration of legendary American composer Leonard Bernstein, a classic-rock concert headlined by an acclaimed English tenor, a star-studded bricolage of Broadway hits, and the third Pops appearance of “Hamilton” star Leslie Odom Jr. — all of these and more are in store for the spring 2018 Boston Pops season. “It’s come out to be a very wide variety of musical expressions,” says conductor Keith Lockhart of the upcoming slate, announced Thursday. This, he explains, is by design. In seeking that across-the-board appeal, Lockhart selected pop star Andy Grammer, the country-tinged hitmaker behind “Honey I’m Good” and “Keep Your Head Up,” to open the season (May 9); the singer previously headlined last year’s Boston Pops July 4 concert. The conductor stresses, however, that the Pops has remained true to its roots, no matter how contemporary the collaborators. This year, he knew that celebrating the 100-year anniversary of Bernstein’s birth was imperative; as such, the 2018 season digs deep into the composer’s catalog, spotlighting his myriad contributions to orchestra, Broadway, and film. Five concerts throughout May will consist exclusively of Bernstein compositions, pulling from across his illustrious career and including material from his scores to “Candide,” “Wonderful Town,” and “Fancy Free” (May 11, 12, 17, 29, 30). Elsewhere, in a planned season highlight, the Pops will mount a concert performance of “West Side Story” (June 15-16); and there will be an earlier semi-staged production of “On the Town” (May 31-June 1). For the Pops, the chance to honor Bernstein held a special appeal; in 1941, the Lawrence native made his professional orchestra conducting debut, leading the Pops in a performance at the Hatch Shell. Shortly after, his work with the New York Philharmonic would send his star soaring. Among other popular artists returning to play with the Pops this season are tenor Alfie Boe, who’ll run through rock hits from the likes of Pink Floyd and Led Zeppelin (May 15-16); Tony Award winner Sutton Foster, who’ll anchor a Broadway celebration (June 6-7); and “Hamilton” alum Leslie Odom Jr., who’s reuniting with the Pops for the third time in two years to perform his own music and selections from the Lin-Manuel Miranda smash (June 12-14). Pops laureate conductor John Williams will also return to lead his traditional film night, adding compositions from “Star Wars: The Last Jedi” (May 23-24) to the program. Gospel Night, a Pops staple for more than 25 years, will again be led by conductor Charles Floyd and feature vocalist Melinda Doolittle (June 2). And, for “Dance to the Movies,” the Pops will team with choreographers and dancers from “So You Think You Can Dance” and “Dancing With The Stars” to execute an ode to dance in cinema (June 9). With so many events on the docket, Lockhart was loath to pinpoint one he’s anticipating above the rest, though he is excited to appeal to a few crucial audience members: namely, his kids. “Disney’s Broadway Hits” will find the conductor on stage with theater vets, performing music from nine Tony- and Oscar-winning Disney scores. Bridging the gap between the Pops’ typically older-skewing audience and the next generation, he says, will be critical to the orchestra’s continued success. Tickets go on sale Monday at 10 a.m. and are available at www.bostonpops.org or by calling 888-266-1200.